©Barry Sandland/TIMB – I had the pure luck of having one of the most enjoyable interviews as met very first exchange,. It gave me instant confidence to continue. This is the 100th interview posted to the blog, and, actually, he was the very first person I spoke to. Photographer’s notes: This is actually the very first person I stopped and asked for their photo. It was one of the easiest exchanges – even now, 99 riders later. He was walking down the road, pushing his bike, carrying the seat because he had broken the frame. I sidled up next to him and asked if he spoke English or French (my limitations). Typical of so many Belgians, the reply was, “English, French or Dutch. Either one.” So many people are trilingual here. I often feel like a pleb. If you want to have a fun chat, talk to a journalist. They have stories and, when encouraged, are eager to share. Anyway, I should have posted the image ages ago. But then, for the start of the blog, I came across a couple of guys pushing a ton of wood on their bikes, one of them wanting to be famous. Then a retired diplomat who thought people should learn to laugh more. Then I felt I wanted to keep the image for a week, build some traffic. Then the weather turned for the worse and his autumn apparel seemed out of place in the wet, cold winter. One of my favourite photographs moved into hibernation, waiting for a springtime posting. Then I saw I would have a century soon. There would be 100 cyclists profiled and the journalist seemed the ideal choice. I am happy to be at the century mark, and happy to return to the beginning. 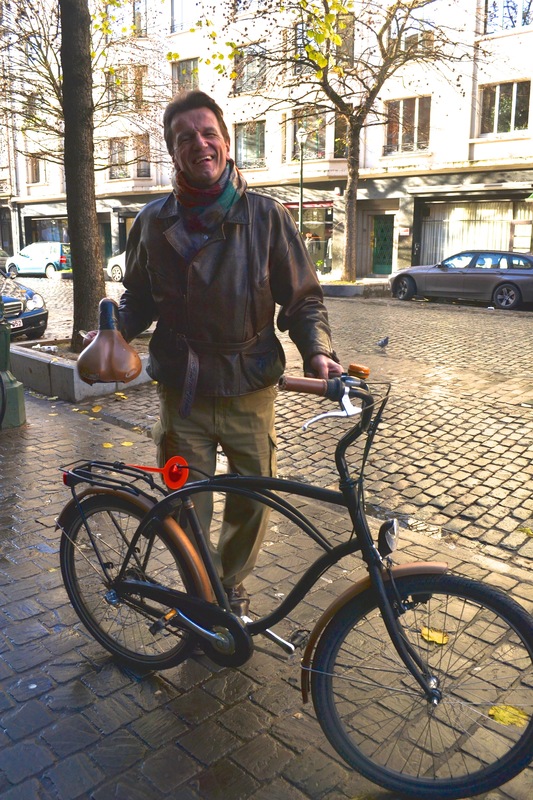 This entry was posted in city bike, commuter, Europe and tagged 2015, April, century interview. Bookmark the permalink.